Happy Monday, friends! Regular readers of Three Thrifty Guys will know that there is occasional talk here about the importance of preparedness and self-sufficiency. My family has, gradually over the last five years, felt more and more of a need to start learning how to be more self-sufficient. We moved to a hobby farm a year and a half ago, have slowly been expanding our garden with the goal of making it big enough to provide our family’s veggies for the entire year, and are learning the art of chopping and stacking wood for the wood-burning stove we’ll install this year. At times, our work seems somewhat pointless, especially when we consider that it took us several hours to can 12 jars of salsa, knowing that to buy 12 jars of salsa would’ve taken 45 minutes including travel. But this past weekend, we learned a real lesson on the dangers of depending completely on others for any aspect of your needs. Where we live, our heat, stove and hot water run off of propane gas. We’re still learning the ins and outs of gauging how much propane we use, and suffice to say, underestimating has cost us some extra cash. Toward the end of December, we started to get low in our propane tanks again, so I called the propane company to schedule a delivery. They generally run 10 days or so out, so I knew we’d be waiting at least a week for our delivery, which was fine. Then the major cold snap hit our area in the Midwest – again. Several straight days of sub-zero temps drained our tanks faster than we had planned, and we didn’t know whether or not we’d make it until our Monday delivery. I called the propane company on the Saturday before our scheduled Monday delivery, and waited on hold for two hours only to be told that it wasn’t likely that we’d get our propane any earlier, even if we did pay the $200 “next day delivery charge”. The law of supply and demand had us right where it wanted us, didn’t it! After conversing with the sweet gal at the propane company, she gave me some valuable tips on minimizing our propane use until Monday came around. At the time of my call to her, we were down to 7% left in our tank, or roughly 35 gallons, so this was not good. We turned down the temp on the hot water heater, shut off the heater in the garage, started washing dishes by hand instead of with the dishwasher, imposed a strict “no baths or showers” rule, and committed to cooking everything in the microwave or crockpot, hoping we’d make it until Monday. Monday came, and I felt relief as I watched the driver pull up and fill up our propane tank for the greenhouse. I eagerly anticipated watching him then pull over to the house tank, but instead, he drove down our driveway and left!! What???? I ran out to check and see if perhaps he’d filled the house tank first and I just didn’t see him, but it was now down to 4-5%. I then ran into the house and called the propane company immediately to tell them what had happened. They said they’d call the driver and get him back here. 45 minutes later I got the call, only to be told that he was already gone, so, tough bounce, basically, they’d be back in the area on Wednesday. After much begging, pleading and insisting that I wanted what I was promised, and many calls between us, the scheduler, and the driver, they compromised and said they’d come Tuesday morning. They came, and we were once again able to do basic things like shower and cook on our stove, but the experience really reminded me that it’s never good to be at the mercy of somebody else when it comes to survival. We are lucky that, in our house, we’ve got back up electric heat, which is what allowed our family to stay warm while running on propane fumes, but if the electric had gone out, we’d have been stuck with no other options. Yes, you could say, if we would’ve filled up earlier, we would’ve been fine. 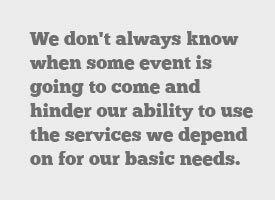 But the take-away from this is that we don’t always know when some event is going to come and hinder our ability to use the services we depend on for our basic needs. It doesn’t take a major war, takeover of your country, or major natural disaster to leave people without necessities real quick. As we learned last week, something as simple as a few day cold snap can have you in a tight spot that you might not be able to get out of. I guess, for us, the moral of the story is to do what you can to make sure that you have the skills to fend for yourself in the areas of basic needs like food, water, shelter and heat. If you’ve got a good, solid backup plan, there’s a lot less to worry about. How do you stay prepared and practice self-sufficiency? Pingback: Do You Have a Desperate Measures Budget? This is what we want to do so badly. We live in town and my husband and I are older, We have a small strip of ground that I did plant in and went to pick your own farms last year to get some more food, I canned everything I could and need to do a lot more. I feel the same way, we depend on to many people to supply for us. I lost my job 2 years ago and haven’t been able to find another. I save every cent I can for the goal of getting some land with a small home on, I want to plant all my own food and will do what I have to so that we not only survive but thrive, We gave up tv this year to add that amount to our saving goal. I have everyone telling me ” you are to old to do that”. Guess what, I am not and praying with hard work within 5 years we will have the money to pay cash for the home and land. Pick up a copy of Backwoods Home Magazine, it is a wonderful publication for anyone who is homesteading or thinking about trying homesteading. One of te contributing authors, Jackie Clay-Atkinson is a full time homesteader who is nearing 70 years old and she is not stopping any time soon! Her belief is your are never too old to start! In fact her last article was about aging on the homestead and things you can do to make chores easier. I want to thank you both for the faith you have in me. I will get a copy of Backwoods Home Magazine. Anita and Laurie you make me want to try even harder. We have given up a lot and still trying to sell a lot so we can do this hopefully sooner than the 5 years we planned for it. I have people in my life that keeps saying you just are to old to do this. I say no I can and will do it. Thanks for the tip on the magazine, Anita! Kimberly, you guys CAN do this. Keep up the good work and don’t give up. You’ve already done so much to learn and prepare by savings and growing so much last year – don’t give up! After Hurricane Sandy, most of my friends and family were without power for over a week. Life came to a halt. Even major NYC businesses were closed for well over five days as they waited for power to be restored downtown. Oh, Stefanie, I can’t even imagine how horrible that must’ve been. Stories like those I hear about Sandy are largely what motivates us to keep on our road to self-sufficiency. As we learned on a small scale last week, it’s no fun knowing that your ability to have your basic needs covered is left in the hands of other people. I love your independent spirit! Love, love, love it! But, I have a question for you (coming from another control freak) – how in the world do you think you’re going to be able to sustain your retirement if you don’t play the stock market – at least a little – to beat inflation??????? You stick to that independant spirit! I think the most important part of Jim’s comment was “PLAY”and “RETURN”. The first thing I want to be concerned about is that my investment it is returned to me! The stock market is a gigantic ponzy scheme! Propped up by QE5 printing of money out of the sky blue yonder. This money is being used to manipulate and prop up some market’s and pressure down other markets. Check out for yourselves on USwatchdog.com web site where they have top economist from around the world commenting on the games that are being played. And the best part about this web site, is there not try to sell you something or trying to spin something. And Jim, get out while you can still get something out. I’m not saying this to be a smart-@#$. I care for you, I’m sure you worked very hard for that money. Thanks! Norlin, I have a feeling it’s going to crash big time soon too. I will check out that site. Our plan at this time is to wait for the big crash, and then sock a chunk of cash into the market, but maybe that’s not the best idea? I think being able to prepare well is the key to self-sufficiency, that’s why you should be able to tell what you need and know where to get some of the alternatives if you can’t get what you really need. Great article Laurie! Thanks, Mark – appreciate the support! The booking of your winter needs I agree with completly. You don’t want to be pricing lp at “peak use” time frame. You might also ask your company or deliverer if they have a “keep filled” service , when the deliverer monitors daily heat units(temperatures)and knows when you should be getting low. I don’t know if your deliverer told you, but if you run your tank empty the deliverer has to do a system check for lp leaks on your heating unit, the common charge for that is $100-125. Yesterday I was trying to clean and declutter and I came across some chemical hand warmers that my parents had brought from up North when they moved in with me. I live in AZ now so I don’t have much need for them but I wanted to test one to see if it was still good so I could throw them out if they weren’t. I tucked it under my sweatshirt and kept cleaning. That little packet got so hot I had to put it in my slipper and then eventually I put it in my bed. I was very surprised that it got so hot and that it lasted 10 hours. Anyway, my point is that having chemical hand warmer packets and perhaps sterno cans in your disaster preparedness plan might be a good idea so if you ran out of propane and the electricity went out you would have some warmth and ability to cook for a little while. Great idea, Daisy! We are installing a wood burning stove this summer, so that should take care of any backup we need. We use propane too but we are on an average monthly payment plan with our propane company and they track our usage over the course of the year(how many gallons we’ve purchased) then they average out per month. They keep track on their system and figure when they think we are going to be getting low, then they come out and fill our tank. So far that has worked very well, I still keep an eye on it myself and the lowest we’ve e we gotten before they filled was 15%. We lock in our price once year, in July, usually when prices are low, so if the price goes up during the year we’re still paying the price we locked in at back in July! Right now my monthly bill is $41.00 per month! Makes it easy to budget. Hmm, we’ll have to look and see if ours offers that option – thanks, Anita!